HAPPY GUYS AFTER HAPPY LANDING. After years of dreaming. 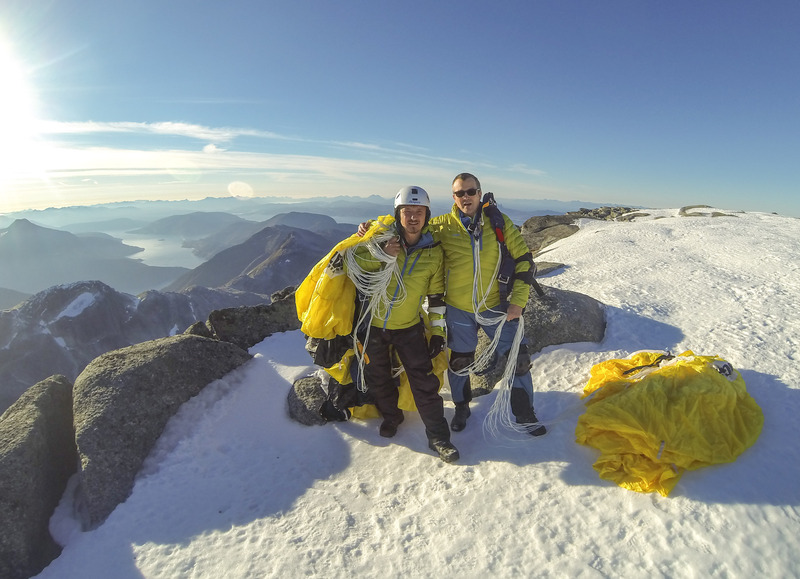 After months with preparation and planning, Bjørnar Jensen and Rune Gjeldnes, became the first to descent Mt. Stetind from the air. The majestic, Norwegian pinnacle rises 1392 meters straight up from the fjord. Many have been dreaming and talking of this spectacular stunt for years. “You can talk to talk, but can you walk the walk”. Bjørnar and Rune did it, 12th of October, with very good help from people on the ground and air. Humble and grateful, that Stetind let them down on it´s top with open arms, finally. Bad weather led to several cancellation. Perfect weather conditions was a must both for the skydivers as well as the ground crew. It takes at least five hours to climb Mt Stetind in good conditions. From the air it was important to not have any turbulence or thermic around the summit. Some wind, but less than 10 knots was set as a demand. Rune used the last week before the jump to carry necessary equipment up the mountain to set up a base camp for the ground crew and check the condition’s. The met, Johan Norman, promised the perfect weather for the attempt on Sunday the 12th. The ground team went up to BC Saturday night to be ready for the last climb up to the summit and the landing zone. The pilot, Fred Eilers, landed at Evenes airport at noon, while Bjørnar and Rune made the last preparations. Excited they took off, and headed for Tysfjord area without any turbulence. After 30 km flight they circled around Mt Stetind and got tombs up from the ground team. 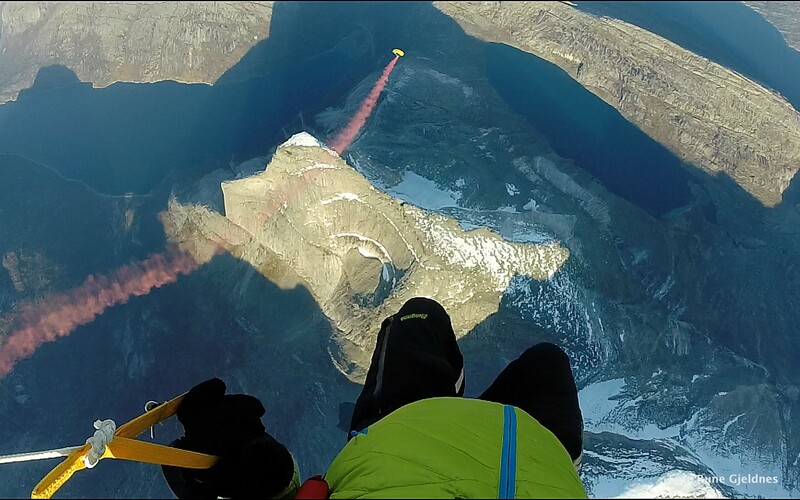 The airplane climbed up to 10000 feet and Bjørnar and Rune were ready for the epic moment – jumping off the plane and land on Mt Stetind. The 6 minutes flight above Stetind was amazing and breathtaking, in the light of low October sun. However, the focus was the tiny landing zone on the pinnacle rising 1392 meters above the fjord. Rune and Bjørnar had been drilling the maneuvers and the different scenarios ahead, and landed precisely at the best spot of the mountain. Definitely a exiting and happy moment after weeks of waiting for the right weather conditions. SPECTACULAR VIEW FROM ABOVE STETIND AREA. AND THEN, THE REAL trip started – carrying and abseiling the gear down from the mountain – and what a descent with 70 kilos of gear to balance down! After several hours the team got safely to the foot of the mountain in the light of their headlamps – tired, but happy after an epic experience. A big thanks to all who have helped to make this possible, and special to Are, Mats, Frode, Sigbjørn, Johan, Tom, Thomas, Jo, Fred and Christian. Across the ridge, the safe way down. Bjørnar disagree, it would have been better to jump, he said.